No, not more new ones. 😀 There was some interest in seeing the first three, so I got some pictures of them. 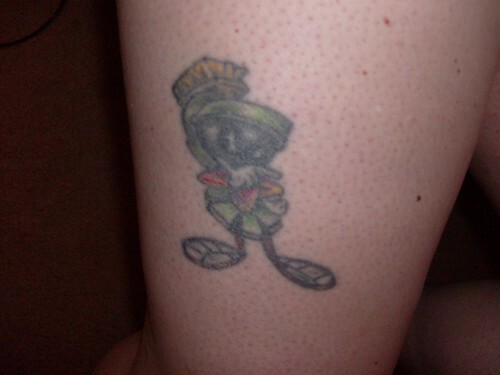 #1 – Got this the summer of 1994, shortly before I turned 21. It’s on my right leg, a little above my knee. Marvin has always been my favorite. 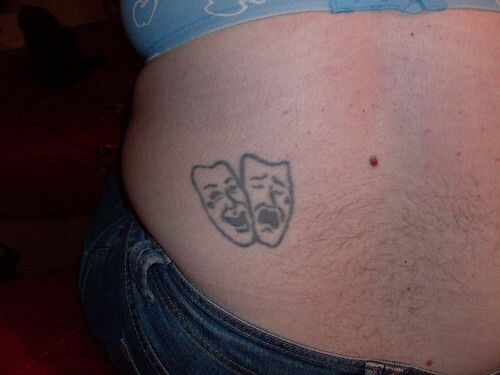 I got this one to celebrate re-declaring my theatre major after having shifted to strictly a math major for a while. My friends Nikki and Ann and I drove from school down to the tattoo studio, where they both got their navels pierced while I had the masks done. #3 – August of 2000. I designed this one myself after finding a website that showed how to draw Celtic knots. June 3rd, 2009 | Tags: tattoos | Category: Misc. Hehe. I got to see your bra! lol I didn’t even “see” the K until you mentioned it. Hee! Too cool. I especially like the K on your back and how intricate it is. I didn’t see the K til you mentioned it either! very cool! Thanks for sharing! I really like the Celtic piece. Hmm, maybe I should show off mine on my blog….I have a few more than you, though, I wonder if anyone would care. the celtic knot K is gorgeous, and so symbolic too. Love the design. I’ve been wanting a tat for a while, you are inspiring me! 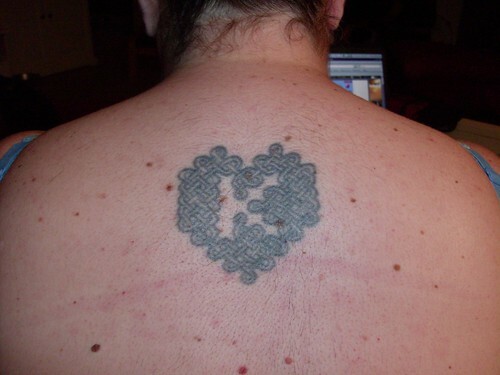 Yeah, I’m with the Celtic Knot Admiration Society! Very cool. I designed my (first so far) tattoo. It’s a heart (valentine’s kind, not bloody gore kind) wrapped in chains with a padlock in the center. Surrounding the heart are vining violets (forget-me-nots, maybe). Off to one side is the key that goes to the padlock, with a treble clef handle on it. It means, “Music is the key to unlock my heart”. I got it after ten years of serious debate, when I was about 28 years old. It’s on my bicep, just like a sailor. My mother, she was THRILLED to see that, I tell ya. Thrilled.